Art Like a Ladie: Opportunities don’t often come along. So, when they do, you have to grab them. get your dose of FREE tips, tricks and prints! Opportunities don’t often come along. 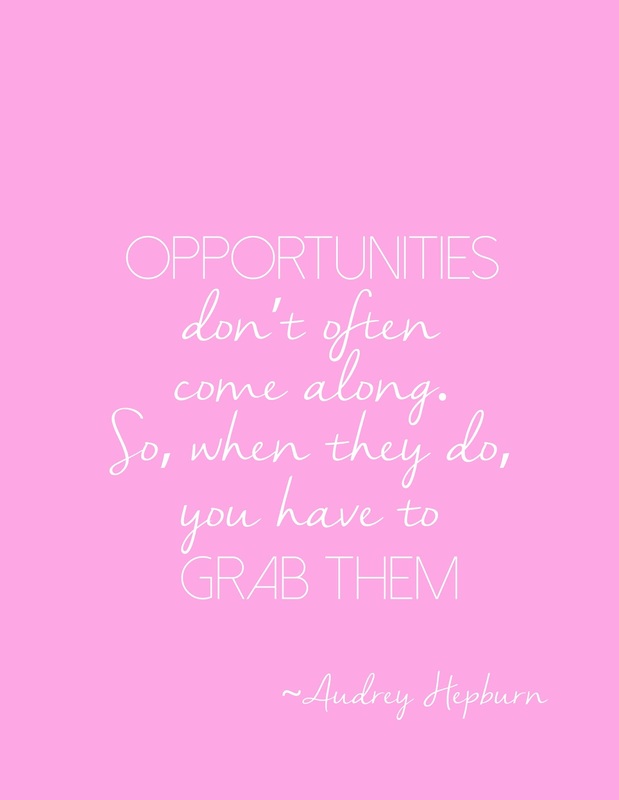 So, when they do, you have to grab them. My experience in law school was fighting just to stay above water. It was not smooth sailing (to say the least) and nothing was handed to me. The bar exam was very much a similar experience—killing myself studying for it, and taking it multiple times, while I saw my peers skate by after their first attempt and move on. Even though I have now passed CA bar, I still find myself trying to shake off this survivalist mentality, as well as the residual blow to my self-esteem—that lingering voice telling me that my best is not good enough. I think we are often held back by the ghosts of our past. The little voice that tells us that we aren’t good enough, smart enough, pretty enough, whatever it is. Now, as I go through the grueling process of applying for legal jobs, I am constantly facing applications that require 2, 3, 4+ years of experience to apply. So basically I can’t get experience unless I have experience. Ironic isn’t it? Like a mouse with cheese, the little voice of doubt in my head begins gnawing once again. 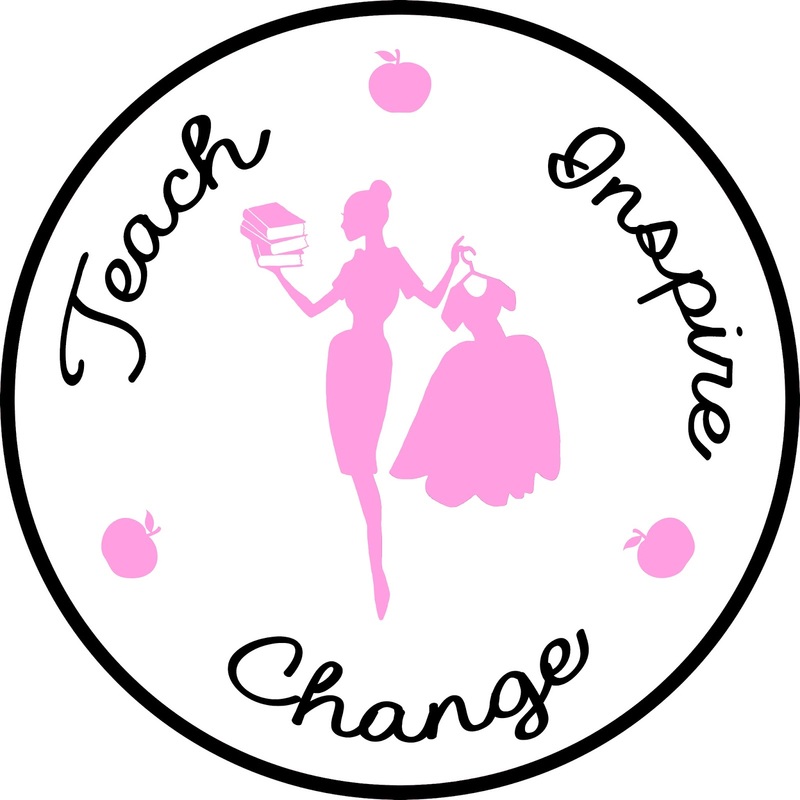 A couple months ago, I was approached by my dear friend, entrepreneur/blogger/teacher, @teachinspirechange, about working on her business logo. The only experience I had in making logos was in making my own for Ladie Katie. The little voice in my head told me that I wasn’t experienced enough to work on a logo and I didn’t want to disappoint my friend. After all, I had been bombarding myself with legal job applications telling me as much. My voice, on the other hand, was excited to expand my empire in a new and unexpected direction. Thankfully, that was the voice I chose to listen to. It’s one thing if you actually are not qualified to do something—for example, I wouldn’t want someone that likes watching ER but who is not a doctor to have performed my tonsillectomy. But just because you haven’t had the opportunity to do something before doesn’t mean you aren’t perfectly capable of doing it. Society tells us that in order to do something we must be the best. Striving for perfection, we can miss out on creative outlets and opportunities. But who says that things have to be perfect to be beautiful? In fact, pushing yourself beyond your comfort zone and trying something new is a great way to spark those creative juices when you feel like your creativity has taken a vacation! After speaking to my friend about the logo design, the gnawing doubt was flooded out of my head by waves of inspiration, ideas and excitement! 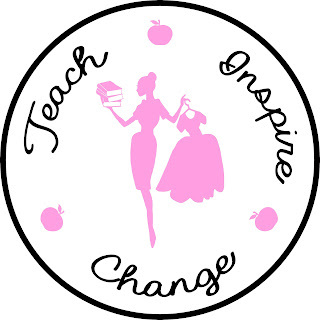 I have now been contacted by multiple businesses and bloggers regarding logo design. Unlike my paintings and illustrations, where, typically, the client sends me a photo or photos to base the painting on, I love the challenge of starting from scratch when I work on logos. Sometimes, clients come to me and it’s my job to help them find their vision. Other times, the clients have the vision and it’s my job to make it come to life. Either way, it is so fun for me to unearth the vision they have or help illuminate their path to discover what it is they want. My friend saw something in me that I hadn’t seen in myself—which was my potential. Although lacking experience, based on my work and personality, she knew that I was the right person for the job. 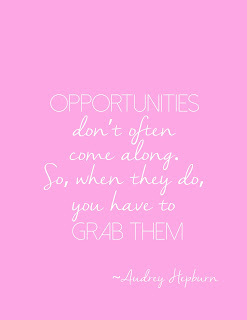 So, like Audrey said, when opportunity knocks on your door, don’t be afraid to answer. What’s waiting behind it might surprise you! Need help with your logo design? Visit my etsy shop here and let's get started! Crafting Creativity & Kindness while making Art for your Heart & Home. Artist, Maker, Lawyer, & Dog-Lover. 10% of pet portraits now go to the SF SPCA! Copyright Ladie Katie 2017. Simple theme. Powered by Blogger.